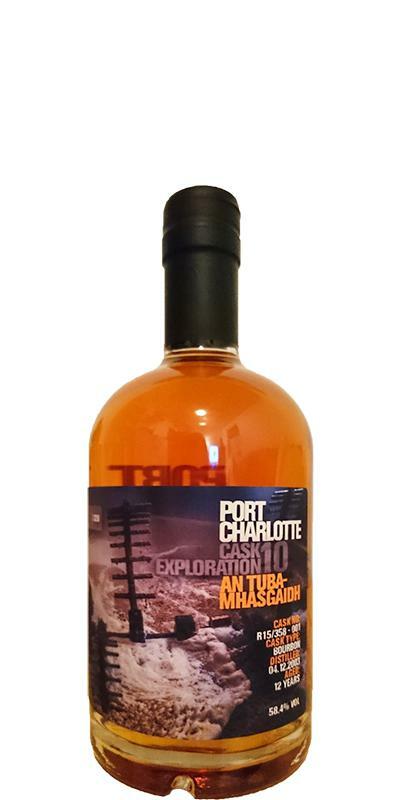 It goes without saying that this is again a Port Charlotte Single Cask without unnecessary cooling filtration or E150a. The label shows this time the great Laddie Mash Tun from the year 1881. Also the Gaelic name of the filling designates the Tun. Those open, wonderfully antiquated seeming, 5m in the diameter and 2m in the depth measuring, cast-iron mash tun from long time past, traditionally the Origin of all distillates of the distillery. But back to Valinch. Let's take a look at the framework data. Full 12 years old. Sounds not that unusual at first. However, there is also about the very popular, strong-footed PC series no longer matured Malt. With the PC12 followed the end and the change to the 8-year-old CC: 01. Among the PC Valinches themselves, the dozen so far, by the 'Tina Mackinnon' Crew Valinch 03 once, featured only the famed CE 01 Seòlaid. The latter is also the only one of the previous series, which was distilled before 2003. Does not sound annoying. Less exciting for some, however, may be the barrel selection. A nasty bourbon barrel in the CEs? Normally, there are usually rather unusual (sweet) wines and heavy sherries. Let us remember the origin of the CE series. The effect of different types of barrel on the heavily peated Port Charlotte distillate (s) first wanted to explore Jim and now Adam with us. No finishes, full maturity should be. So why not have a special bourbon barrel? Bourbon storage has three advantages for me. For one thing, I just love good bourbon barrels. Beyond that, I spontaneously immediately come across a few UA PCs made of bourbon barrels, each of which was terrific in its own way. Last but not least, unlike a Rivesaltes, I can spare Pomerol or Sauternes storage, I can tell in detail about the original occupancy and origin of the barrel used. This barrel comes from the USA, to be more precise probably from Kentucky, otherwise one would have printed at Laddie rather "Tennessee Whisky" or similar on the label. Our white oak barrel has been used in the States exactly once for at least two years to mature a straight bourbon, one can assume. 'Buffalo Trace' may well be taken very carefully with Laddie. But then there is enough speculation. Considering the barrel type used in combination with the heavily peated barley, I decided to use the glass for the Laddie Tumbler. Looks great and fits perfectly here. Eye / nose: optically bright gold. Not spectacular and exactly as I would have suspected the color purely for data. Very beautiful, clear stained glass windows on the edge of the glass. The intense scent from the tumbler has been with me for quite some time, as I slowly poke the PC in my hand. The Malt almost calls for attention. Just for comparison - a bourbon-backed Octomore 6.1 or 7.1 has spent 5 years in the barrel. This one 2.5x as long. That gives him a great volume already in the nose. The sweet smoke, which has become the trademark and unique selling point of Laddie's Port Charlotte series, clearly shows. Interestingly, he does not look as fresh and mentholic as he often seems to me. Instead of eucalyptus notes, it is complemented by malty-fruity impressions. Candied oranges, light blossom honey, a gentle tingling in the nose testifies to the grip strength. Alcoholic sharpness in the unpleasant sense, however, is not even heard in the beginning. No matter how it tastes, the nose deserves a special point anyway. Palate: Very creamy, creamy, full mouthfeel. The very first, spontaneous impressions on the tongue are: FRUITY (yellow, ripe fruits - mirabelles as well as clementines), SMOKE (warm camp fire smoke, not medically in the classical. Islay sense), sweetness (light honey, a little caramel). Vanilla and a hint of cinnamon complete the picture. Wonderfully multi-layered and incredibly harmonious, I would like to summarize the first impressions. Once you've had your first sip, the Valinch opens up another dimension that I did not necessarily expect. Under the smoke ceiling, the impressions of caramel and honey change into darker, more chocolaty notes. Nougat, nut chocolate, dark Toblerone. No really fat, dominant chocolate notes, such as Spanish PX barrels they sometimes pass on to a distillate, but only associations, but here in the overall package as unexpected as well as harmonious and fascinating. It's hard to believe what it can do in a supposedly simple bourbon barrel. Finish / Conclusion: The finish remains pleasantly sweet and vanilla. It's long and wonderfully warm and soft for a heavy-handed smoker. Water seems completely out of place here. I would worry about shaking the perfect balance of the malts. Towards the end, one can still perceive slightly smoldering logs. Overall, absolutely nothing to complain, everything fits from AZ. Such a really nice bourbon barrel is just a great thing and not to be underestimated!